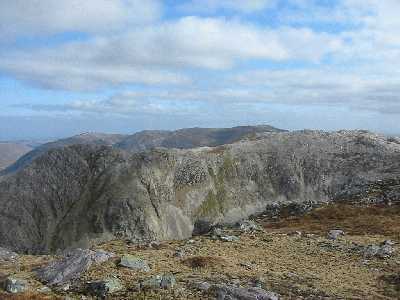 Picture from IainT : B Mhairg slabs on the left, nowhere near as steep as they look! 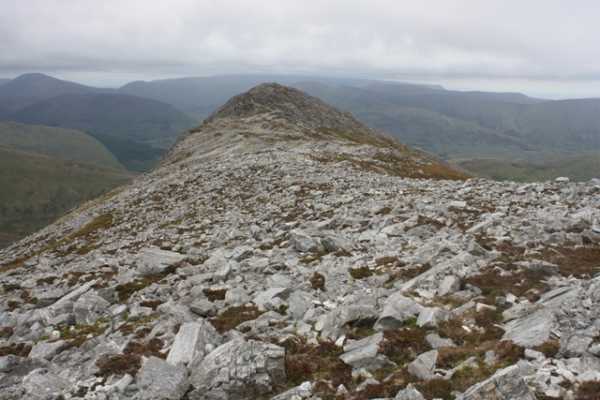 Picture: B Mhairg slabs on the left, nowhere near as steep as they look! In October 2009 I first visited Binn Mhairg and have been back a few times since to this little gem. After studying the map and observing the terrain, I opted for a nice little loop walk from the east, taking in both Binn Chaonaigh and Binn Mhairg. The east ridge of Binn Mhairgh is never too steep. Just be aware the short grazed grass on the ridge is very slippy when wet. 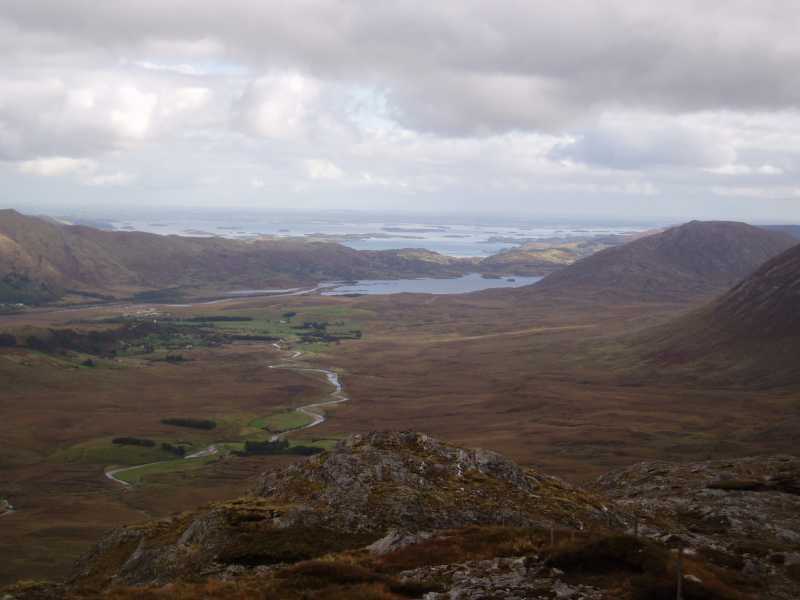 This scenic little walk gives a good impression of the beauty and roughness of the Maamturks. Views are outstanding all along. 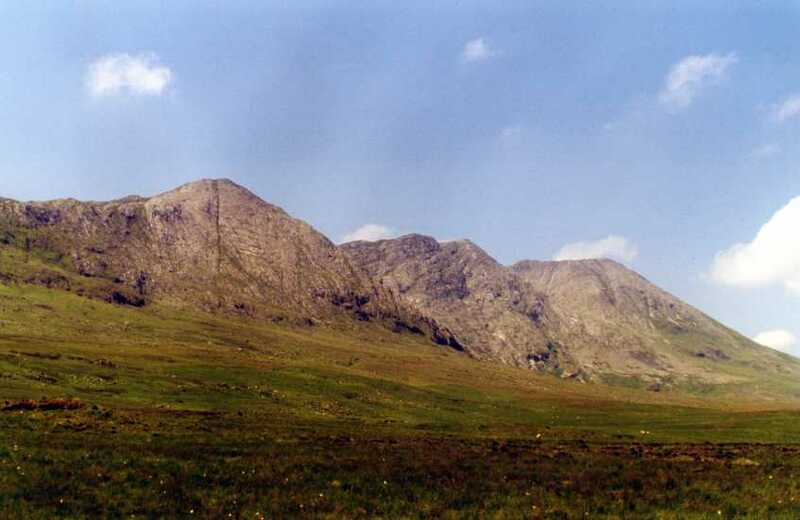 The walk is easily accomplished in three to four hours. 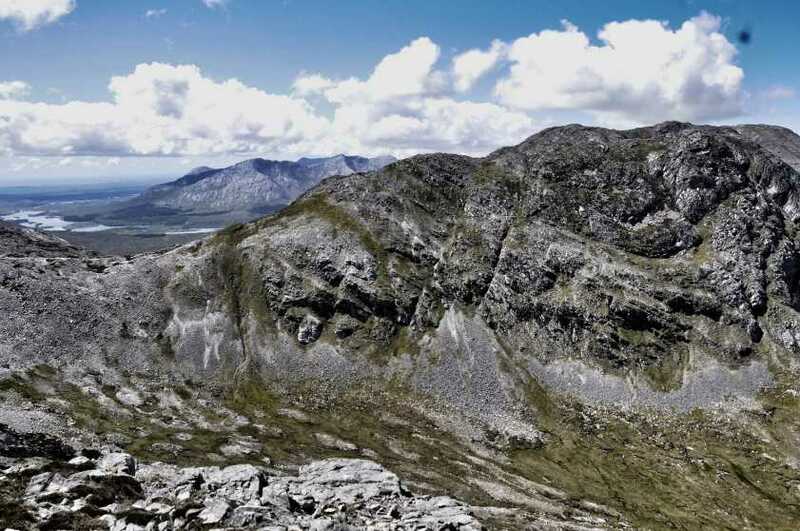 However I'd recommend to add sufficient time to take in the stunning views and maybe do some additional exploring outside the trail (lakes and other summits / viewpoints). The walk starts at the small carpark on the northeast side of Maumean col. You reach this carpark by following the Maumean signs from the Maam valley road. If you come from Maam Cross you take the small road left just before Maum bridge. From the carpark you follow the road for a few hundred meters until the bend. Here follow the Western Way signs up to Maumean col. Upon reaching the col ascend straight north starting from the left of the chapel. A bit higher up you'll notice a fence on your right. You basically follow this fence, which you keep well to your right, almost all the way to the top of Binn Chaonaig. Note that the terrain right next to the fence is very eroded because most walkers simply stick to the fence. From the top follow the easy ridge to the NNE. Upon reaching Binn Mhairg descend its east ridge. Again there is a fence which you keep close on your left hand side and follow all the way to the valley floor.